Get some historical perspective at Basilica di Superga and Castello di Fenis. National Cinema Museum and Forte di Bard will appeal to museum buffs. 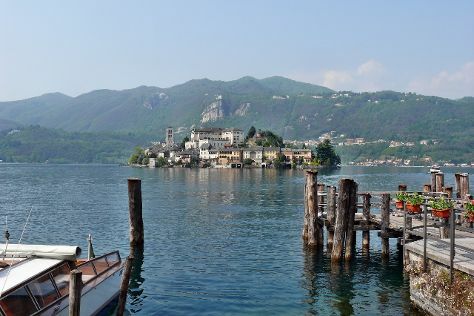 Explore Turin's surroundings by going to Thermal Spas (in Pre-Saint-Didier), Castello di Issogne (in Issogne) and Orta San Giulio (Lake Orta & San Giulio Island). And it doesn't end there: examine the collection at Museo Nazionale dell'Automobile, pause for some serene contemplation at Santuario di Oropa, admire all the interesting features of Juventus Stadium, and identify plant and animal life at Parco Nazionale Gran Paradiso. To find ratings, more things to do, other places to visit, and more tourist information, go to the Turin itinerary builder. If you are flying in from United Kingdom, the closest major airports are Malpensa International Airport, Turin Airport and Cuneo International Airport. In July, plan for daily highs up to 34°C, and evening lows to 25°C. Finish up your sightseeing early on the 25th (Tue) so you can travel back home.